The program Marune.exe is an interactive multimedia simulator for the diurnal modes of Marune. It displays a picture of Benbuphar Strang and environs, as viewed under the light of various combinations of the four Marune suns. There are two linked ways to control the display. First, the vancean user can manipulate the four suns directly, dragging any of them above or below a horizon line. 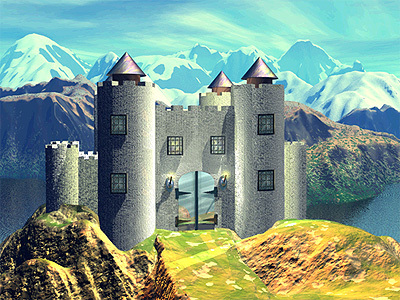 At the conclusion of each drag, the scene will change accordingly, showing what the castle and landscape would look like during the corresponding mode. Second, the user can click anywhere on a table of the sixteen modes, to display a mode directly. A mode indicator in the table indicates the currently selected mode, and the suns will move above or below the horizon accordingly. Thus, when Vance writes "On the mantelpiece a clock showed the mode to be aud, with Furad and Maddar about to set and abandon the sky to chill isp" the user can start by selecting aud from the table, then drag the suns Furad and Maddar below the horizon to enjoy the changing moods of the day as he or she reads. The AUD-iovisual Aide can much intensify the reader's experience of the Rhune realms. This program is free to anyone who wants to download it. Size: 12.7 MB uncompressed; 7.6 MB zipped (17 large, high resolution graphics). 16-bit color. 32-bit color strongly recommended for full enjoyment.